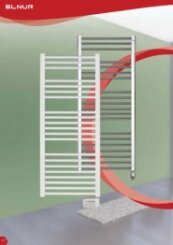 The chrome ladder radiator is a traditional, simplistic design able to discreetly blend into any environment. 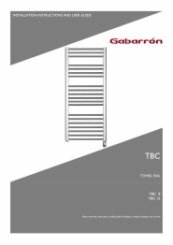 A great towel storage solution, the radiator is available in a range of sizes and powers to help warm any sized bathroom. The Elnur TBC is easily installable, all fittings are supplied and the provided template for wall fixings should be used to ensure safe and accurate radiator positioning. The manual temperature control at the bottom of the radiator is user friendly and discreetly tucked away. The 1.5 metre mains cable is useful when wall space can be limited. The TBC range uses a low density thermal fluid ensuring no maintenance is needed. Thermal fluid is quick to heat up and easy to control, reducing nominal power needed. It utilises an electronic thermostat which controls the temperature of the room. An indicator is illuminated when the apparatus is consuming energy. Elnur’s are 100% efficient, converting all input power into output heat. 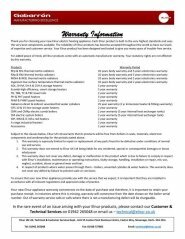 They have a dual function, one for heating room and the other for heating towels, this helps improve the performance and economy of the radiator. The small regulator allows you to accurately adjust the temperature. It offers great control without complication and are popularly used separately to the central heating, and the basic manual variant ensures your central heating remains unaffected. Item arrived in agreed timescale, and was very well packaged. That's really great to hear, thank you for taking the time to review us as excellent.